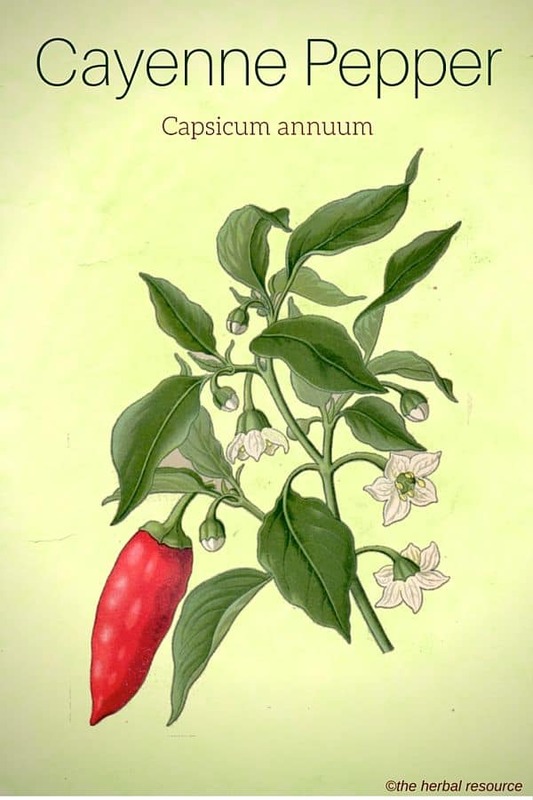 Botanical Name: Capsicum annuum Capisicum frutescens. 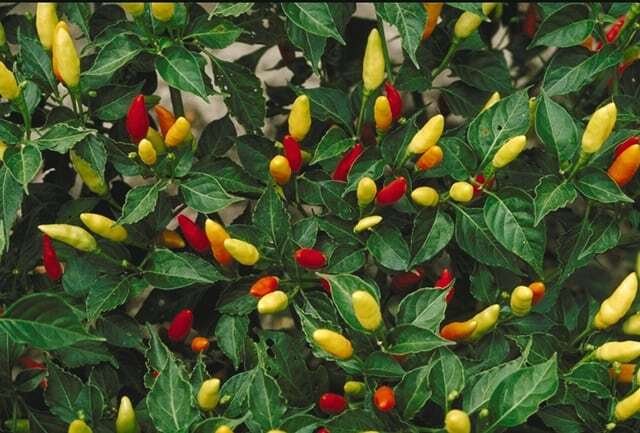 Other Common Names: Capsicum, tabasco, hot pepper, chili, chili pepper, spur pepper. Habitat: The capsicum herb is a tender, variable annual. It has a branched stem and a leaf-shaped much like a lance. It grows a bell-shaped white or green flower, which appears during the spring and summer months. After it flowers, its hollow and elongated fruit appears – the fruit is often referred to as a pod. When ripened, the fruit is normally a bright and shining fiery red, but can also be orange, yellow or green. The cayenne pepper itself is made from the dried pods of the plant. Plant Parts Used: The fruit or pod of the plant is used for both culinary and medical purposes. The main medicinal properties of cayenne are derived from a chemical called capsaicin. Capsaicin is the ingredient which gives peppers their heat. Cayenne is a very high source of Vitamins A and C.
It also has the complete B complex family while being rich in organic calcium and potassium, which is one of the reasons it has been suggested for the heart. It contains capsaicnoids such as [easyazon_link identifier=”B001G7QGYA” locale=”US” tag=”herbal-resource-20″]capsaicin[/easyazon_link], as well as saponins and pyrazines. The fruit gets its color because of the carotenoids it contains. Cayenne pepper has been described by some herbalists and physicians as the catalyst herb. 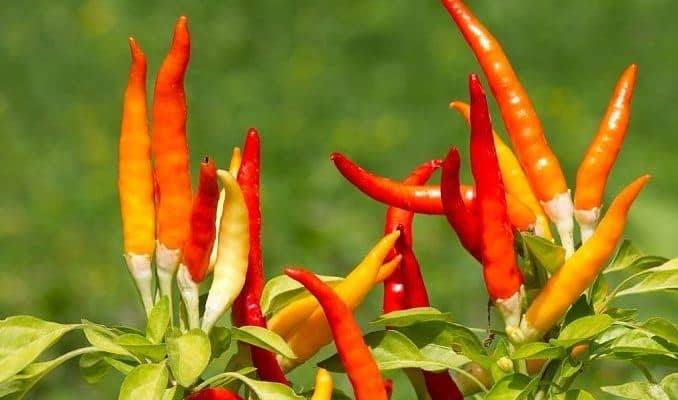 Many herbalists believe that cayenne is the most useful and valuable herb in the herb kingdom, not only for the entire digestive system but also for the heart and circulatory system. Because it acts as a catalyst, it increases the effectiveness of other herbs. In addition to its ability to stimulate the circulatory and digestive systems, it has a tonic and antiseptic effect as well. It is not uncommon for it to increase perspiration thus eliminating toxins through the skin. It is considered a good herb to prevent colds, sinus infections and as an herbal treatment for sore throats and to resolve the cold stage of fevers. Cayenne can be recommended for the improvement of circulation, varicose veins, and digestive problems such as dyspepsia furthermore it is also used as an herbal remedy for colic, Crohn’s disease, motion sickness, flatulence, and bleeding ulcers. It aids in the support of the following organs: heart, kidneys, lungs, pancreas, spleen, and stomach. It is thought useful in treating various forms of topical pain associated with arthritis, fibromyalgia, osteoarthritis, rheumatism, lumbago and spasms. It is used externally as an herbal remedy for psoriasis, sprains, itching, unbroken chilblains, neuralgia, and pleurisy. Cayenne is used for laryngitis as a gargle and is thought to be important as a gastrointestinal detoxicant. It is attributed to stopping heart attacks, nourishes the cells and has been suggested as an herbal remedy for regulating blood pressure. Cayenne pepper is also thermogenic and is thought to reduce appetite, hence its reputation as a good herb for weight loss. Also, the herb has been found useful for providing protection to the stomach lining from aspirin. Cayenne can be used to prepare a simple, yet effective concoction that has a cleansing effect on the system. It can be prepared by combining the juice of a lemon with a pint of warm water, one tablespoon of maple syrup and just a pinch of cayenne. One or more cups of this mixture taken every day will prove to be highly effective. Those on a diet consisting of raw fruits and vegetables should consume cayenne pepper as this will aid in the process of digestion. Also, it helps in the absorption of vitamins and prescription medicines. Cayenne is easily available in health food stores or pharmacies. But before using it, it is always a good idea to consult a health care provider to ascertain whether the herb is suitable. Those suffering from gastritis or ulcers need to use cayenne cautiously, as it may exacerbate their condition.